If you asked me, as a child, what I wanted to be as a “grown up” I probably would have said a teacher or a librarian. It made sense, I’d usually be found with my head buried in a book, and I loved my time at school. But had I known about the work of Jane Goodall growing up in my animal-loving family, I’m sure I’d have wanted to be just like her. Fancy spending a life talking with the animals and walking with the animals! But there you have it: we don’t know what we don’t know. Now if you’re a Monday night ABC junkie like me, you’ll have seen the fantastic Australian Story this week about former wildlife ranger Sean Willmore and the legendary conservationist Dr Jane Goodall, DBE. Goodall knows just about everything there is to know about chimpanzees and the protection of wildlife and their habitat. She’s spent 50 years in Africa observing and protecting the animals she adores, the chimpanzees of the wild. To spend a lifetime completely absorbed in one’s passion couldn’t possibly be described as work. Goodall is also wise enough to know that a love of animals isn’t enough to save them in the world of poachers and corruption. Where an elephant tusk fetches upwards of $3,000 per kilogram and Al-Shabab, the Somalia-based wing of al Qaida, raises $600,000 every month from poaching to fund its activities, profiteering from animals is a serious – albeit corrupt – business that takes no prisoners. 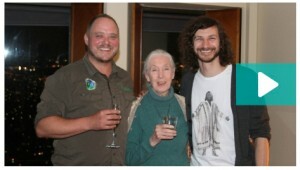 That’s why Goodall is supporting The Thin Green Line initiative focused on protecting and equipping the people who dare to protect the very wildlife so many of us adore. Is it bad to admit I’ve never really given a thought to those park rangers, and the dangers they face day in and day out? But there it is again: we don’t know what we don’t know. So this idea to focus on the protectors of the animals seems like a great and logical idea for someone like Goodall, who’s spent a lifetime living and working with the animals in Africa. She’s seen it all and knows the practices all too well. And yet it wasn’t her idea. Instead it was an Australian Sean Gillmore who came up with the plan, and through a chance meeting, got Goodall on board. Turns out the park rangers who literally put their lives on the line every day they go to work are poorly paid, poorly trained and poorly resourced to do the job. Changing these factors has a bigger impact on wildlife protection than opening a sanctuary. Thousands have lost their lives defending the wildlife they love, and when they are murdered by the poachers, their families are left destitute. Widows are left without a home as they vacate for the replacement park ranger, and children are left with no means of schooling. The Thin Green Line is changing this too, and ensuring that the families left behind have a home and access to education, which we all know has the longest lasting impact of any social investment. The very powerful lesson here is that it’s the combination of Goodall’s wisdom and life’s work, together with Gillmore’s energy, innovation and commitment to the change, that’s getting the cut through. Individually they each were doing good work; but it’s the bringing together of the two that has made their work and success truly great. This notion of bringing the experience of Goodall – a pioneer in the space of animal research and welfare – and combining it with the passion of a young change maker wasn’t lost on me. I’ve watched the Male Champions of Change with interest since Liz Broderick put the wheels in motion back in 2010. This is a promising initiative and I can see the power in getting those with the power to lead the change in workplace gender equality. I’ve personally observed and experienced the energy these men are bringing to the gender balance agenda, the fresh eyes and fresh thinking, and their competitive spirit in driving activity. But I’m just not sure about the male-only approach. There are many women who’ve committed a lifetime to the goal of gender equality, and who have built up a significant body of research and experience in this space. Many of them have gone on to lead significant business enterprises. Many are leaders in our communities. They all understand the challenges women face in progressing their careers in a way men never can. Could their experience not be interwoven, integrated, into the goals and activities of the male champions to really change the game? With this thinking in mind, its encouraging to see the recent joint initiative by Chief Executive Women and the Male Champions of Change to explore The Leadership Shadow and the view that when it comes to promoting women to leadership, “It starts with us”. How I measure: the rewards, recognition and accountability that I expect and achieve. In other words, by exploring the way leaders speak, act, prioritise and measure gender balance in every day actions and words, we learn about where leaders are having a positive or negative impact and where changes will have the greatest payback. Having men, and women, work together to understand the many and varied carnations of leadership can only be a good thing. This kind of collaboration, like the work of Jane Goodall and Sean Gillmore, will surely achieve more than Australia’s top businesswomen, or businessmen, could achieve on their own. Let’s hope its just the start of more to come. ← To everything (turn turn turn) there is a season. What’s your season, right now?